Godzilla vs Megalon (1973) – SKREEONK! This review will be for the Japanese version of the film. In the early 1970s, underground nuclear testing was causing widespread destruction in the form of earthquakes throughout the east. In Seatopia; a country miles below the surface of the ocean, the nuclear tests were ripping them apart. Finally, they had enough, and released their guardian monster Megalon upon the world. Their secret agents attack an inventor, his little brother, and a friend, and steal their robot, named Jet-Jaguar, to use to guide Megalon to the targeted areas of attack. The small band manages to escape and retake control of the robot and send him to Monster Island to enlist Godzilla’s aid. Jet Jaguar returns, and instead of returning to his master, he grows to enormous size and begins to battle Megalon himself, trying to give Godzilla some time to show up. 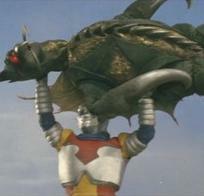 Gigan shows up at the request of the Seatopians to aid Megalon, and the tide is quickly turned in their favor. 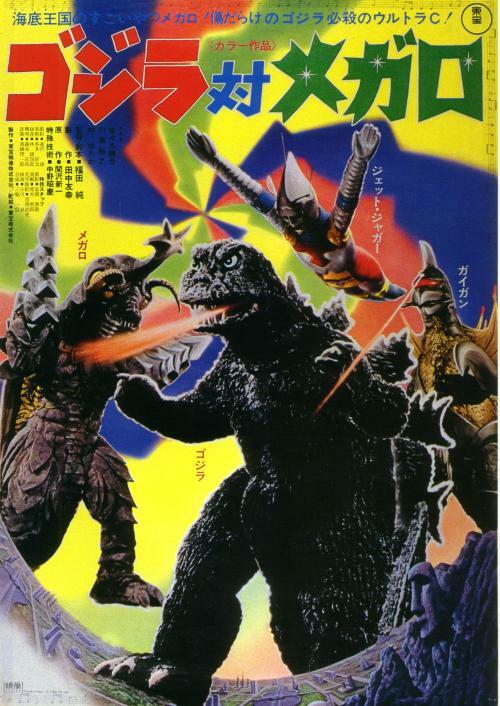 Godzilla finally arrives to help Jet-Jaguar, and together they succeed in defeating Megalon and Gigan. Gigan flies away and Megalon returns to his undersea home. Jet-Jaguar returns to his creator, but not before giving Godzilla a big thank you. Jet-Jaguar, now returned to his normal size, accompanies the inventor, his brother, and their friend back to their home. You either love it to death, or you hate it with a passion. This movie goes in so many different directions its crazy. Most everything that was poorly used in the previous film, Godzilla vs. Gigan (1972) is again used here. This film seems more like it belongs in an Ultraman episode more than an hour and twenty-minute film. The film reflects its short production time with its lacking quality and generally uninteresting storyline, and can lose the interest of the viewer very easily. The Seatopia plot, the Seatopian spies, and the main characters are interesting, but not developed at all. By the end of the film, the viewer feels kind of empty in the development area, finding themselves not caring about what happened to any of the characters, save for Godzilla and Jet-Jaguar. The acting in this movie is relatively poor. There is basically no character development from any character in the movie. The three leads, Goro (Katsuhiko Sasaki) the inventor, Rokuro (Hiroyuke Kawase), Goro’s brother, and Hiroshi (Yutaka Hayashi), their friend, have little development. The viewer must gather from common sense that he is an inventor, and must also figure out the nature of his relationship with Hiroshi. We can’t figure out if he actually lives with them or if he just doesn’t have any other place to hang out. And Rokuro. Is he really Goro’s brother? Goro looks to be about thirty, while Roku looks about ten. Just a couple of the many things that can be nitpicked about the film. Besides not having good character development, they just do a bad job in the acting department as a whole. Hiroshi is probably the most enjoyable of the three, but that’s not saying a lot. Sasaki, as Goro, is one of the blandest actors to ever grace a Godzilla film. His character portrays almost no emotion whatsoever, which makes the viewer think he is reading his lines directly from a cue card. 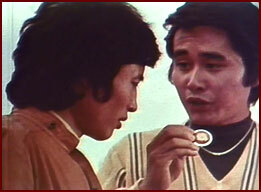 Hayashi’s character, Hiroshi, also portrayed little emotion, although much more than Sasaki did. Hiroyuke Kawase as Rokuro did almost nothing in the movie, save for coming up with the idea for Jet Jaguar to go and fetch Godzilla from Monster Island. He is just another painful example that children should not star in a Godzilla movie. None of the other actors are really worth mentioning, although one can’t ignore the Seatopian spies, played by Kotaro Tomita and Wolf Otsuki. They just weren’t given hardly anything to do. Wolf was basically silent the whole film, and Tomita was another very stale role. 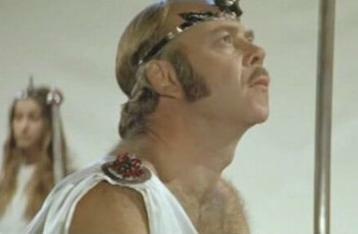 The only other that deserves mention is Robert Dunham, as the Seatopian emperor Antonio. 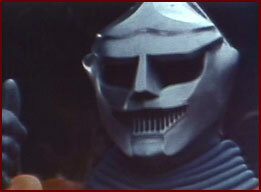 Dunham is an accomplished actor, but is given nothing to do except to release Megalon. He gives his speech with emotion, but it is overshadowed by his sorely limited screen time and everything else bad about the movie. In short, the acting is pretty much the pits. The monsters in the movie were…different. 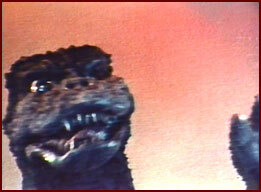 Godzilla himself looked too friendly, with a large head and huge eyes with proportionately large pupils. His dorsal plates were more silvery, and were puffed out, giving them a plush appearance. One thing this movie can boast is that it brought two fan favorites into the monster world: Megalon, the title monster, and Jet-Jaguar, the inventor’s robot. 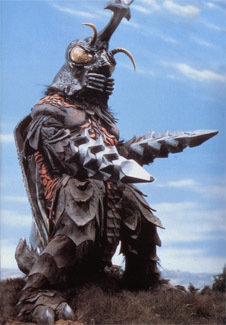 Megalon is a two-legged beetle type monster brilliantly colored in orange and black designs with compound eyes and two antennae sticking out of his head. In the center of his head juts out a trident shaped horn, from which he spews his lightning attack. He can also fire bombs from his mandibles that explode nearly on contact. The most interesting thing about Megalon would have to be his hands: two pointed, ribbed metal cones that when brought together form a drill, which he uses to burrow through the earth. Jet Jaguar is an Ultraman-type robot with a pointed head, red, yellow, and blue paint, and the biggest grin you could ever imagine on a robot. He becomes self-aware after returning from Monster Island, and then reveals the ability to change his own size; growing to match Megalon in height and mass. He attacks Megalon to give the King of the Monsters time to catch up, and he holds his own for the most part until Gigan shows up and spoils the fun. Then the two monsters have a volleyball match with JJ until Godzilla shows up and spoils their fun. Gigan appears much the same as he did in his previous movie, so no description is needed there. The monster action is quite possibly the saving grace of this film. When the whole crew shows up, one of the most enjoyable battles of the series begins. 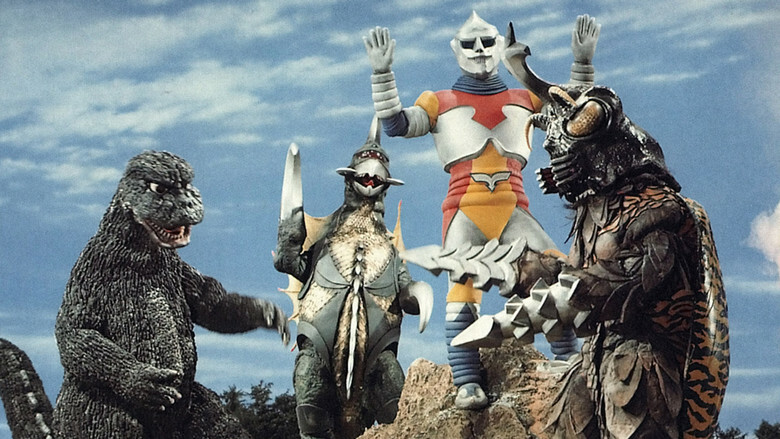 The monsters are hilarious; especially Megalon and Gigan, whose humanized reactions to Godzilla and Jet Jaguar are just…human. Perfect example: When Godzilla and Jet Jaguar are trapped inside the ring of fire, Megalon and Gigan are standing back, taunting them and laughing, and when Godzilla escapes, both Megalon and Gigan hold out their hands as if to say, “What the heck?” In short, the monster fights are the most comical of the series. It’s hard to sit through it and not laugh. The special effects are, like the previous installment, lacking. Stock footage rears its ugly head again; lifting footage from at least nine other Toho films including Ghidorah, The Three-Headed Monster, Ebirah, Horror of the Deep, War of the Gargantuas, and Destroy All Monsters. The stock footage in Megalon, however, is used more effectively, unlike the previous film. No night-to-day from one second to the next, and we only got two Godzillas this time instead of four (three if you count the water scene Godzilla, which was only seen for a few seconds). Aside from the stock footage, the rest is fair. One shot worth criticism is Megalon’s bout with the fighter jets. As he jumps to attack them, we clearly see Gigan’s claws destroying them; a scene lifted from the previous film. Megalon and Jet-Jaguar’s flight was awful; both monsters’ flying scenes were accomplished through the use of models, and not very effectively. Jet-Jaguar can be forgiven since he is a robot, but Megalon has wings, and is just not effective at all. Megalon’s destruction of the dam was impressive, and that’s about where the praise dies down. The last thing worth mentioning is Godzilla’s most famous move (whether that’s a good or bad thing, I don’t know), the flying kick, or tail slide as some call it. Yes, Godzilla defies the laws of gravity and lands two very funny, very long-range kicks to the title monster, with the aid of Jet-Jaguar. The final thing I will mention here is the score. Riichiro Manabe returns to score his second Godzilla film; his first being Godzilla vs. Hedorah (1971). His score for Hedorah was nothing to crow about. In Megalon, he reuses the theme for Godzilla but brings it up a beat; making it more bouncy and fast-paced; worthy of a hero. It is a vast improvement over his previous installment. All-in-all, this movie can be viewed one of two ways: an awful excuse for a movie and the one that ruined Godzilla, or an incredibly mind-numbing and hilarious adventure in the world of Godzilla. I prefer the latter; though I won’t overlook the fact that it is one of the lesser entries of the series. From a critical view, this one gets a two-star rating. For my personal entertainment; it gets three and a half! Posted on September 25, 2011 2 By Jon D. B.	Kaiju Movie Reviews! Posted in Kaiju Movie Reviews!, Toho Movie Reviews! Pingback: Vinyl Profile: Jet Jaguar | SKREEONK! gang in a G sequel or and anime show? Next Post Behold – Project JJ! Previous Post Project JJ – Ol’ Blue Eyes!